June 3, 2015 – Lockheed Martin has completed assembly of NOAA’s GOES-R weather satellite and is now beginning critical testing of the spacecraft. The first of four next-generation geostationary weather satellites, GOES-R will provide a major improvement in quality, quantity and timeliness of weather data collected over the current Geostationary Operation Environmental Satellite (GOES) system that monitors weather over North America. 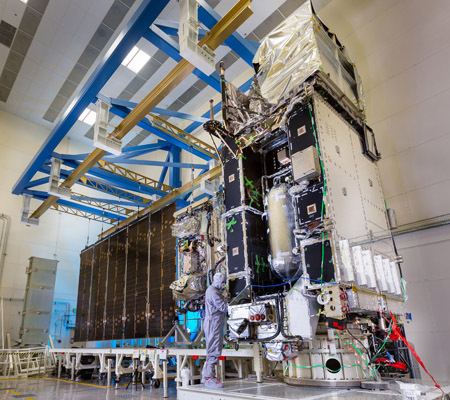 The GOES-R satellite is now undergoing environmental testing to simulate the conditions of launch and the extreme environment the satellite will experience in space. The first stop for the satellite and its six instruments is a 65 foot-tall thermal vacuum chamber at Lockheed Martin’s facility near Denver. Over the next two months, the satellite will be powered-on, tested in a vacuum and exposed to extreme cold and heat. The satellite will also undergo a variety of additional tests including reverberant acoustic, separation and deployment shock, vibration, and electromagnetic interference and compatibility testing. GOES-R is scheduled to launch in March 2016 on a United Launch Alliance Atlas V from Cape Canaveral Air Force Station, Florida. In addition to the four GOES-R Series satellites, Lockheed Martin also designed and built the Solar Ultraviolet Imager (SUVI) and the Geostationary Lightning Mapper (GLM) instruments that will fly aboard each spacecraft.